For me, the incentive behind running has more to do with mental weight loss than physical weight loss. It has more to do with being nimble & light on your feet, of operational efficiency in this physical world, of having a clear head within it. Something i was hoping Murakami might touch on in his popular running book, but i don't see eye to eye with Murakami & much as i want to like him, i think his writing is overrated. In my post a few years ago on Murakami—my take on what [i] talk about when [i] talk about running—i mentioned running as a way of staying one step ahead of the demons, exercise as exorcism, to stave off mortality, which might be somewhat true in hard times, when the demons are nipping at your heels. But once you're in the clear, running is more about maintaining efficiency, of staying nimble. In the first lecture of Italo Calvino's Six Memos for the Next Millennium , which i'm reading at the moment, Calvino waxes about the meaning of «Lightness». Of course he speaks of lightness in relation to literature, but a lot of what he says can also apply to what i'm talking about with running. & i'm not just talking about running when i talk about running, but i'm talking more generally of fitness, eating & burning clean. «Running» like how a machine runs. Even more generally, of the efficiency of lifestyle, beyond the body to your immediate ecosystem—of minimizing waste & your carbon footprint, of recycling—something i feel pretty good about here, in terms of sourcing most all our food locally (or growing it even up on our small patio) & recycling most everything. We rarely eat processed food, it almost always comes from basic ingredients (as you are generally forced to here) & we rarely throw food out. Cooking for me is about more than just cooking tasty & nutritious meals, but it's an orchestra, a timed collage, using what ingredients & leftovers you have on hand, in as few pots & pans as possible (to save hot water). For example, i've been really into broths lately, using discarded bones & boiling down to reduce to use later. And while i love artichokes & they are in season now, i don't like making them how the Romans do (except for a few times last season just to say i did) because it's wasteful, decadent. Though Americans tend to waste the best part, which is the 6 inches of stem before the artichoke—even tastier than the «heart». I boil all of it, and then use the brothy, oily, minty, lemony water they are boiling in to flavor the accompanying pasta. I derive great pleasure in thinking about these things—almost as much as i do in eating them. Calvino also goes into Lucretius in great depth, in relation to his notions of atomism & language (which i discuss here). 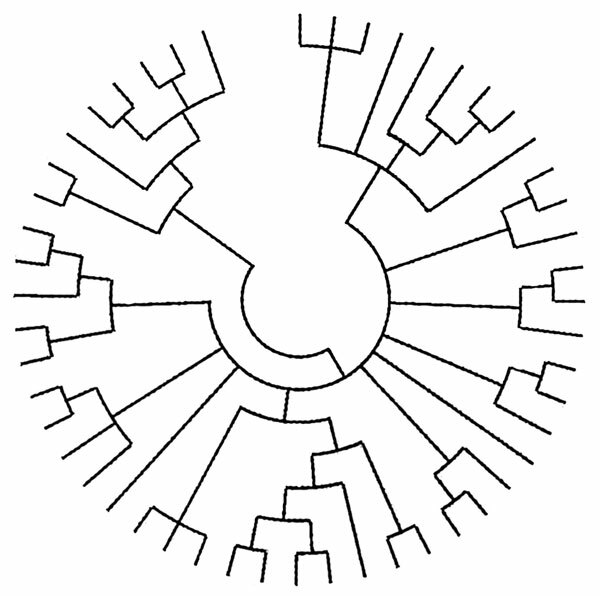 Literature reduced to it's most basic components, code strung together from these 26 characters, just like muscle protein being built up of 20 amino acids. When i pulled my groin/hamstring in Sicily last year (almost a scary setback for running), a lot of it had to do with my lack of agility, of not being so nimble, of not respecting gravity (i was trying to highstep through the window of a ruined farmhouse), of not listening to my body. It's not so much a matter of being fast or strong, but being in control, of knowing your limits. Of being able to turn it on when you need to, and to sustain. The goal is not to be aware of weight, to not be dragged down, to not be aware of the physical presence of your body beyond what is at your core. To activate the potential of your Deleuzian BwO. This is your mind on running. 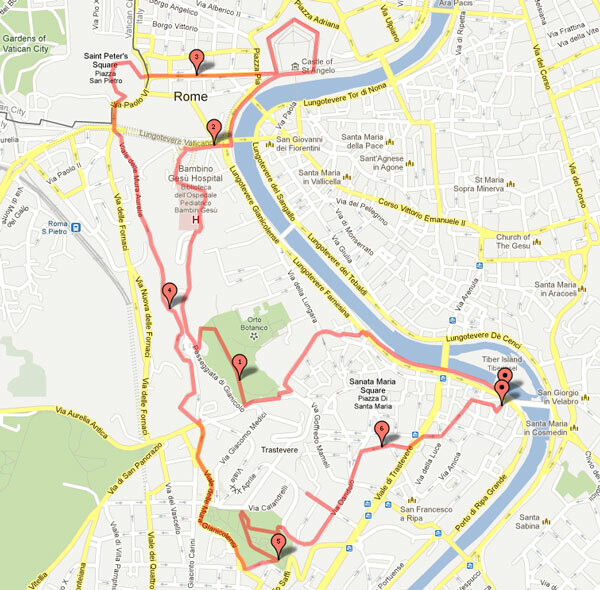 Anyway, not to get distracted again from the intention at hand, which is to map out some of my favorite running routes in Rome that keep me inspired to run. All these routes use isola Tiberina as the origin (after all this is where Romulus & Remus were abandoned & saved by the she-wolf). And it's by no means inclusive—villa Ada seems great for running, but it's too far away from us, from what i've seen on bike it seems good for running. And i also don't mention villa Borghese, which is popular for running, because just getting to it is 8 km for me & i also don't think it's all that. Mileage is approximate in these 5 routes—if you want exact mileage, use the gmap-pedometer. (I generally don't like timing or measuring my runs). This is probably the run i do most often because i don't like dealing with traffic. 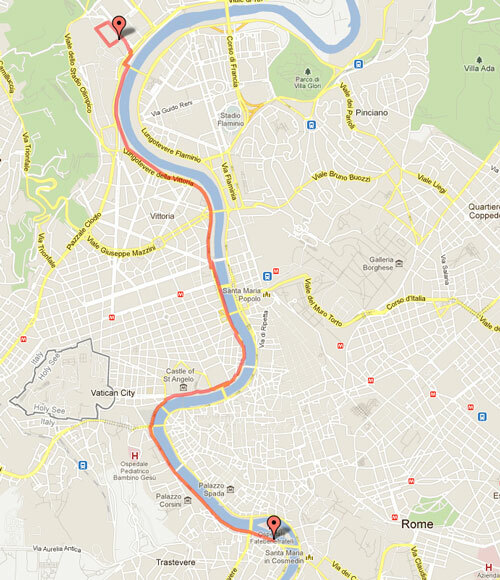 And running along the Tiber is nice (especially with the new bikepath they finished last year). The negative is that the route is flat (unless you throw some stairwells in, but they are generally trashed with piss, needles & broken bottles). And if you run the river on the weekends it can be crowded with spandex-clad bikers. Last winter it was often flooded & after the floods receded it was caked with mud which made running difficult. And in the summers they set up junky beer tents all along the river & towards evening there's lots of drunk people down on the banks making it impossible to run. Even though there's no bikepath on the eastern bank, sometimes i run over there because it's sunnier (the initial stretch before castle St. Angelo) in winter & there's no people. I usually run under 13 bridges past ponte Risorgimento (the one after the bridge with the holes in it) & up the two ramps to street level, which is about 10 klicks. But you can keep going on the red bikepath up at street level if you want more. Keep going past one more new modern bridge that isn't on google maps yet, until you get to the grand ponte Duca D'Aosta, at which point you can run up the stairs & cross the street & take a victory lap around the olympic stadium (not the huge soccer stadium, but the ceremonial stadium just east of it lined with some 65 marble statues (by my count)). And while you're running on those sampietrini you can imagine Abebe Bikila winning the '60 Rome Olympic marathon... barefoot & in the dark (judging by the footage, that route seems like a mix between the Appian way & coliseum routes below). 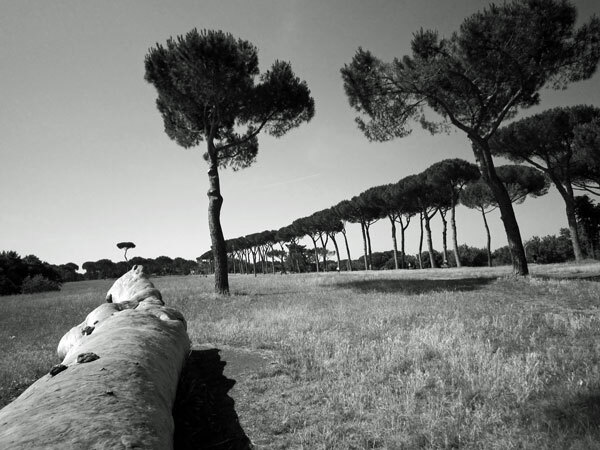 Villa Doria Pamphili is one of the better parks in Rome to run in. There's lots of little side trails & variations you can do so you don't feel like a rat running in a circle with hordes of other runners (which is how i used to feel in Central Park). And there's some good hills & lots of umbrella pines. To get there from isola Tiberina is about a km, along the river to ponte Sisto, then cross through Trastevere up via Garibaldi. 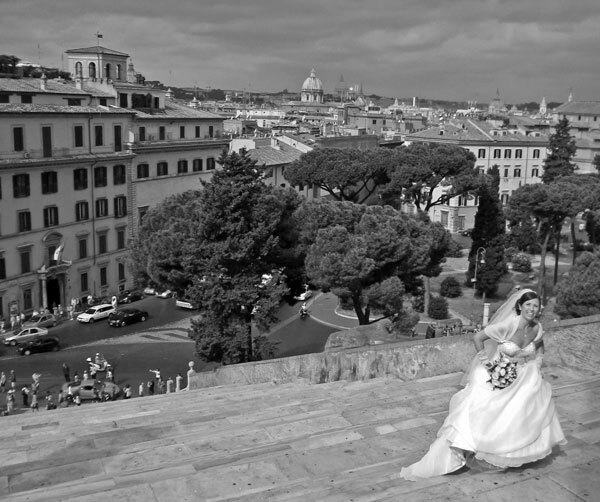 There's a shortcut that avoids the car traffic switch-backing up the hill—when the road jogs left, go up a stairwell & up a steep road (though you'll miss seeing the Gianicolo fountain & the fascist/futurist looking monument dedicated to those who lost their lives in the 1849 siege of Rome). Continue up past the big arch to the entrance of villa Pamphili & through another arch & down to the right. Once you get to the mansion & the shrubbery maze it becomes a loop road & there's lots of variations to take. If you stick mostly to the perimeter it's about 10 km. If you cross via Leone XIII (turn right on via Rosa Luxemburg) then you can add more mileage in the other less-trafficked section of Pamphili. 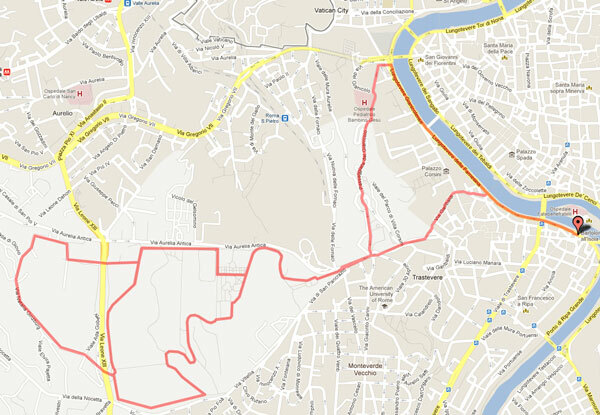 I also put another variation on the above map to get back, along Gianicolo hill past the statue of Garibaldi. As i discovered a few days ago, just happening to run by at the exact moment, they fire off a loud cannon there everyday at noon. This is a shorter run i usually do on my «down» days, often treating it more like a par-course/cross-training route. When i get to the graffitied ramp opposite the Aventino, i usually stop & stretch & do sit-ups & push-ups on the sunny marble blocks & pull-ups from the iron bollard rungs hanging off the walls. You can also do sprints on the steps or the ramps. Further along there's an actual pull-up bar & some other par-course installations. There's also lots of friendly wild cats & chickens on this route & it's less prone to flooding & doesn't have all the obnoxious beer tents in the summer. If you turn back at the orange metal stairs it's about 6 klicks. 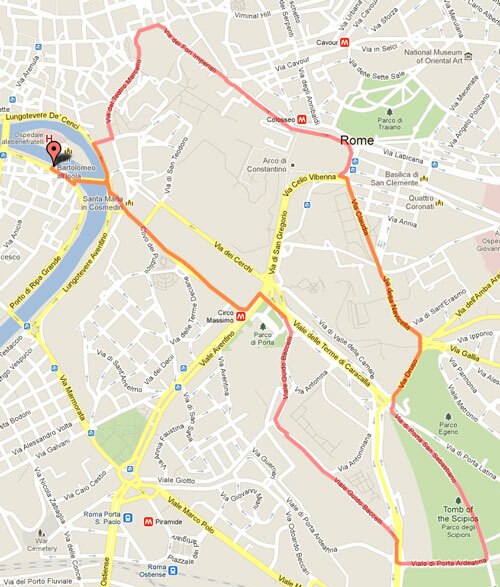 Or you can continue up above for another km or two, until you get to the wide bridge at viale Marconi. And again, if you want variation, you can run back on the other side of the river (go up the ramp under the train tracks & cross at ponte Testaccio). And if you still want more, there's a nice hill if you turn in at via Marmorata until you can can cut sharp left & go up the Aventino (shown on map above) past the Knights of Malta keyhole, Santa Sabina church & the orange-groved park. Then you can either add a lap or two around Circo Maximo or cut down the steep scenic sampietrini-ed foot path (Clivo di Rocca Savella) past the crazy American homeless lady that feeds the cats & will likely yell obscenities at you for running through her turf. Start across the English bridge up past circo massimo (or if you want some hillage, detour up the Aventino), at FAO turn right & run down the middle of viale Aventino on the tram tracks (room enough to pass if one does come along), past the pyramid near where Keats is buried, down via Ostiense, past the Montemartini museum (see below) & the gasometro cylindrical shells & St. Paul's (largest cathedral in Rome after St. Peter's), then cross back over the Tiber (some nasoni for water along the route, including one just before the bridge) & then back along the river, past a new pedestrian bridge that looks within days of being opened (in which case you'll be able to run straight over to the gasometri). This is probably the most scenic route if you want to take in some of ancient Rome. Cross the river & run through Circus Maximus & then follow the bikepath. Once i get past FAO i usually cut right past the running track (closed to non-members) around the backside of Terme di Caracalla, following viale Guido Baccelli (which is nice to run on) past the nursery. 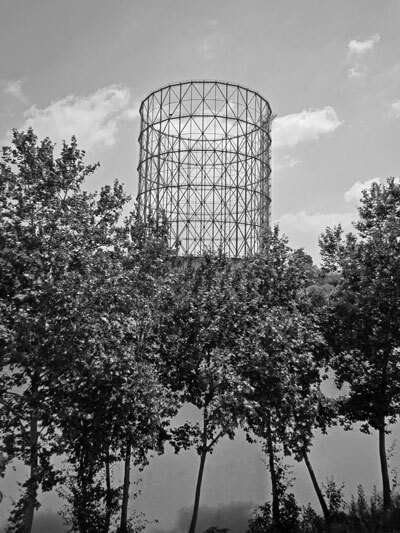 When you get to the aqueduct you can either turn along along it or stay on the bikepath along via Cristoforo Colombo. If you stay on Cristoforo it gets a bit tricky, but there's a trail that cuts through some empty lots (around when you get to Largo Angelo Fochetti). Just when you think you're lost you'll get spit out on via Appia Antica, just before it forks off in 3 directions. Take the middle road (closed to cars) that goes up the hill to the San Callisto catacombs (if open, this past month or two (Jan-Feb) it has been closed). Then you merge back onto Appian way, past the San Sebastian catacombs (if only they let you run underground in the 11 km of catacombs). After a while you get to the true part of Appia Antica with the huge Roman-era stones paving the road. Obviously it's not the ideal running surface, but will keep you on your toes (and there's usually a dirt trail skirting along the sides). In theory, Appia Antica is closed to cars on Sundays, but no one obeys the law (it's surprising enough people drive on it on any day) & on sundays there's more pedestrians & bikers—so pick your poison. You can make this run as long as you want, i usually turn back once the novelty of running on the huge Roman slabs wears off (or you twist an ankle) to make it like 12-15 km. The only time i've taken it to its end at the perimeter road, is on bike (thinking about Lucretius—speak of the devil)(see video below). 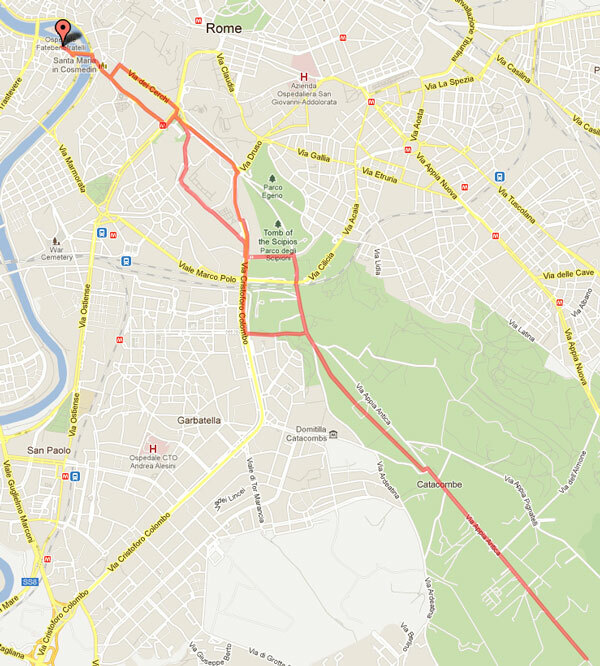 The return route in the above map follows Appian way to the aqueduct then straight back along Viale delle Terme di Caracalla (which strangely, this little (1 km) stretch of road, in the park along the north side, is the most popular place to run in Rome, not sure why, except maybe to just be seen). 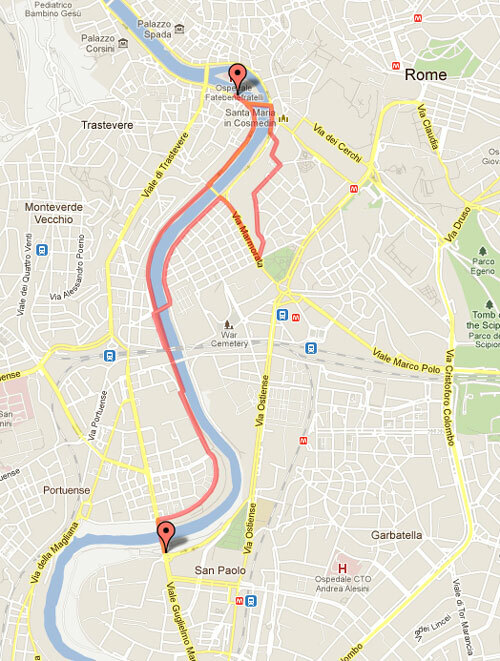 This is a nice scenic run to do on Sunday morning before Rome wakes up. 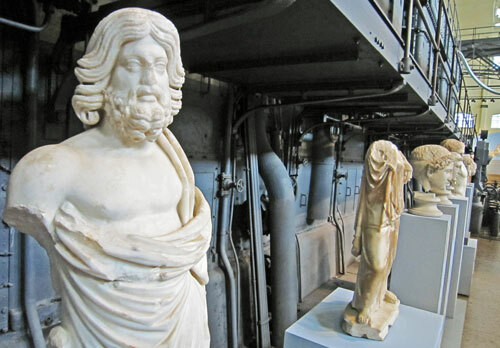 It follows the same route as the Appian route above, past Circo Maximo & the Caracalla baths. When you get to the aqueduct, turn left on viale di Porta Ardeatina & follow it until you get to a break in the wall & a big inset arch (Porta Appia). Cut down via di Porta San Sebastiano (sampietrini-ed, but scenic) then take a right on via Druso. Then a left up the hill on via della Navicella (named after the ark on the summit). Follow this then go counter-clockwise around the coliseum. On Sundays, the grand via dei Fori Imperiali is closed to cars, so it's exhilarating to run on (there's a strip of pavement in the middle of the otherwise sampietrini road). Loop around the giant white «type-writer» up via del Teatro Marcello. Just before the ramp going up to Michelangelo's Campidoglio, there's a long set of marble steps going up to the Santa Maria in Aracoeli church. I usually sprint these to failure, 8-10 times. If you want to do the equivalent of the Empire State building, then run them 13 times (which i've done once). (There's 124 steps, so if a step is 0.25 meters, that's about 30 meters or 100 feet of elevation per trip). And don't forget to enjoy the view from the top. If this bride i captured before can do it without even breaking a sweat, so can you. Here's another route for those seeking elevation, that goes 2.5 times up & down Janiculum hill (that although is not counted as one of the seven hills of Rome, is the second highest, rising ~65 meters above the Tiber). Starting at Tiber island, run along the river or through Trastevere & go up Garibaldi like you are going to Dora Pamphili. Just past the fascist era monument & the large baroque fountain (Fontana dell'Acqua Paola)(or the top of the stairs, depending on which way you go), go through the gate right to the Gianicolo, but rather than follow the Gianicolo road (lined with all the statues), cut right down the dirt road along the fence of the botanical garden (great way to see the gardens without paying). The trail goes down & then cuts back up back past where they still fire the cannon everyday at exactly high noon (to keep everyone in synch). Follow the Gianicolo, with great views of Rome below, past the baby Jesus hospital & down right to the river, go back along the Tiber a bit, then come back up at Castel Sant'Angelo & do the pentagon-shaped loop, then back towards the Vatican & loop around St Peters (crowds permitting). At the intersection of Porta Cavalleggeri & Fornaci (facing the tunnel), look for a small road (viale delle Mura Aurelie) cutting up to the right, up the Gianicolo at a long slow burn, hugging the old Aurelian wall. When you get to the big arch on top, go straight across & keep following the Janiculum wall through the Monteverde neighborhood, past one road breaking the wall & then keep hugging the wall until you see a small doorway in the wall & cut into Villa Sciarra (one of the best kept secret parks of Rome). Cut back & forth through Villa Sciarra, coming out on via Dandolo back down towards Trastevere. 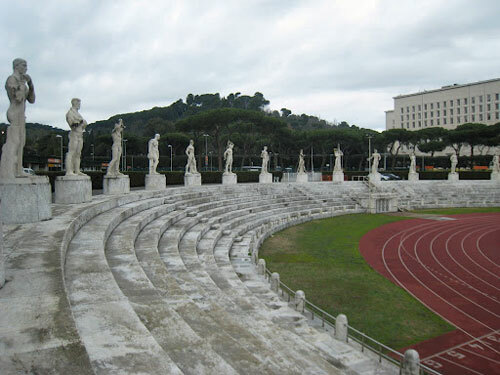 If you still have gas in tank, hook left on viale Glorioso & you'll find one of the best sets of stairs for running in Rome (126 steps, 2 steps higher then the Capitoline stairs in the above route, though interestingly, also broken down into sets of 21). Run the steps to failure.